Rockin HK Outfitters are proud to offer extensive backcountry fishing, pack trips, and day rides into Yellowstone National Park. 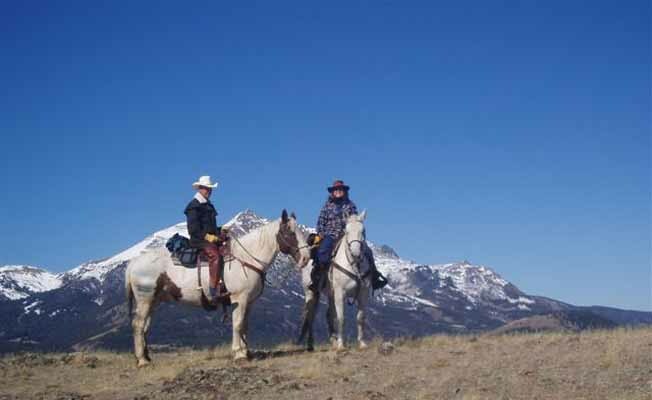 Using their horses and mules they are able to access 97 trailheads, 1,200 miles of trails, and 104 designated stock camping sites. Full day fishing trips depart though the north entrance of the park near Gardiner. Spend the day with your experienced guide marveling at the unmatched beauty of Yellowstone National Park. Let your trustworthy horse take you across creeks and climb wild flower covered hillsides. If it's fishing you are after, our trips take you into some of the most remote backcountry you will find in a days ride. We can supply the equipment or you can bring your own. Rockin' HK also provides quality, specialized pack trips into Yellowstone Park. The low-impact camping and horse packing methods used, have been practiced for generations. The meals provided are phenomenal gourmet meals that enhance this backcountry experience. Comfortable base camps are set on pristine rivers and high country lakes such as: the Snake River, Slough Creek, Lamar River and Sportsman's Lake. The fishing from these base camps is some of the best fly fishing in the world. Overnight pack trips are designated to suit the guests needs. These trips originate from many different trailheads depending upon which region of the park has been selected. Come join the fun! Located at the Chico horse barn where we also offer 1,2 or 3 hour trail rides.